Zeitgeist presents a performance and informal discussion of Karlheinz Stockhausen's Mikrophonie, a classic 1960s electro-acoustic work for large amplified gong and six players. 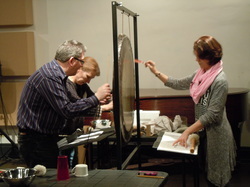 Two percussionists play a large gong with a variety of implements, another pair of players use hand-held microphones to amplify subtle details and noises, and the last two players run soundboards that filter and manipulate the sounds picked up by the microphones. Lowertown Listening Sessions invite curious listeners to enjoy adventurous sounds and insightful conversation with the music-makers of our time. Held at Studio Z, Zeitgeist’s performance space in Lowertown St. Paul, this monthly happy hour series brings guest artists from all genres of new music (jazz, classical, world music, folk, and more) for performances and informal discussion in an after-work setting with food and beverages available from Golden’s Deli.